Mount Baldy aka Mount San Antonio is one of three peaks in Southern California with an altitude higher than 10,000 feet and with at least 500 meters prominence (the other two are Mount San Gorgonio and Mount San Jacinto). 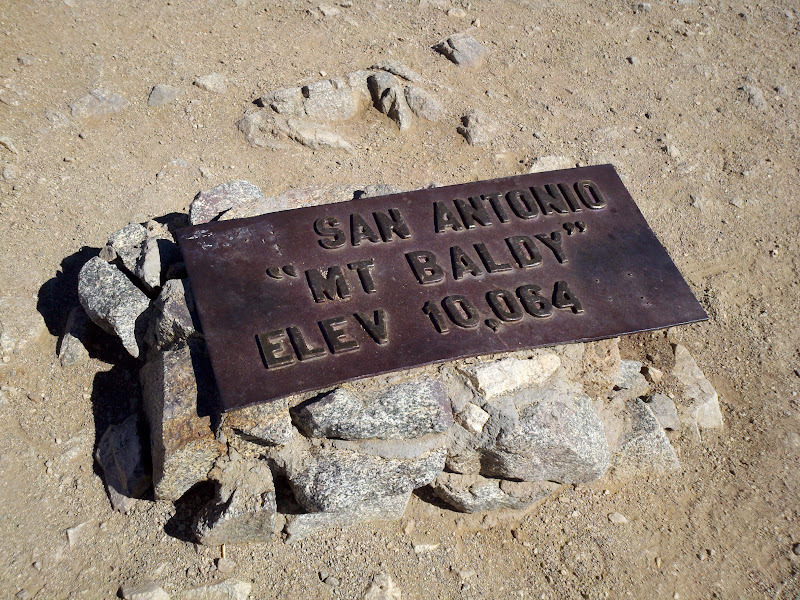 Mount Baldy is also the highest point in Los Angeles County. The peak offers spectacular 360-degree views, including those of the San Gabriel Mountains, San Bernardino Mountains, San Jacinto Mountains, Santa Ana Mountains, Mojave Desert, and Pacific Ocean. Devil's Backbone Trail starts at Mount Baldy Notch (top of ski lift #1). The first part leads up the slopes of chair #4, then the trail follows the east ridge to the summit. Most of the ridge is exposed to sun and wind. Instead of using chair #1, a 3.6 mile 1,700 foot dirt road can be hiked up and/or down. Ski Hut Trail or Baldy Bowl Trail starts at Manker Flats (where the road is split). The first part leads up the dirt road, with a view of San Antonio Falls. After about a mile, the trail leaves the road to climb the steep mountainside. After about two and a half miles total, it reaches San Antonio Ski Hut (8,300 feet). 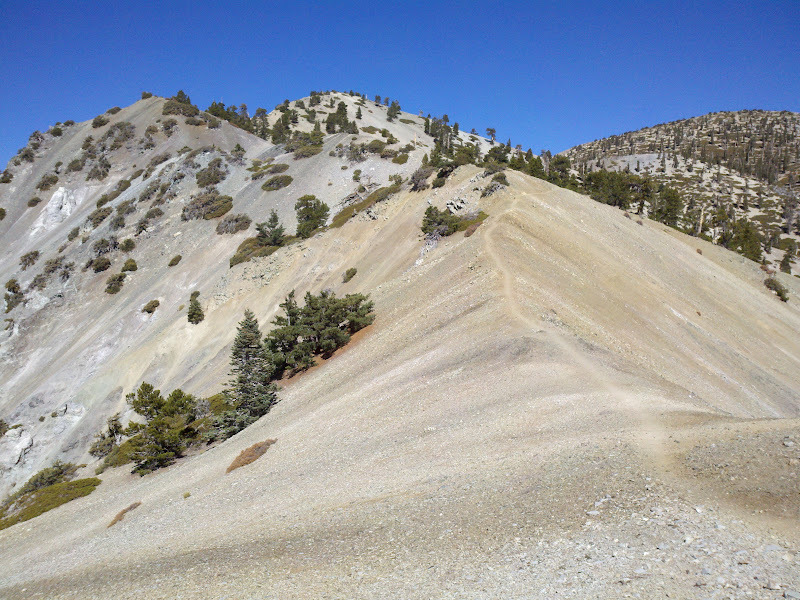 Then the trail passes through Baldy Bowl and climbs the ridge to its left, which leads straight to the summit. Ski Hut Trail and Devil's Backbone Trail can be combined into an 11 mile 3,900 foot loop. 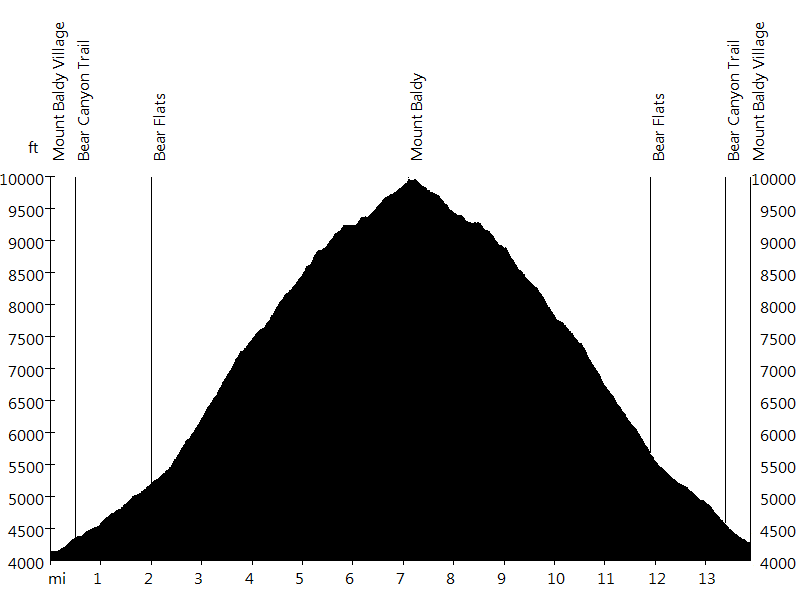 Register Ridge or Mount Harwood Trail is the steepest ascent, gaining 2,800 feet of elevation in 1.4 miles (2,000 feet per mile or a 38 percent grade). The first part is the same as the Ski Hut Trail. Shortly after the Ski Hut Trail leaves the dirt road there is a register on the right, and shortly after the register is the trail fork. The steep, unmaintained trail is Register Ridge. South of Mount Harwood the trail crosses Devil's Backbone Trail and continues on to the summit of Mount Harwood (9,551 feet). 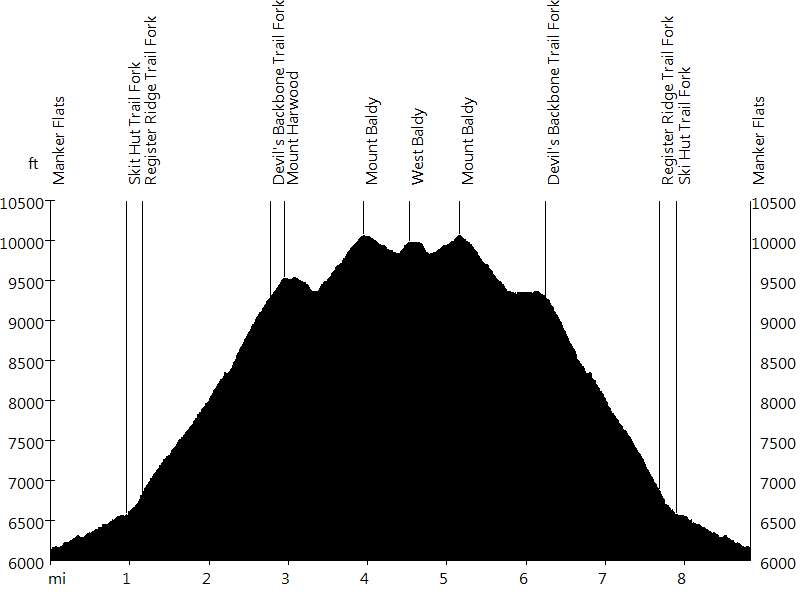 After reaching Mount Baldy, the hike can be extended to West Baldy (9,988 feet) to include three summits. 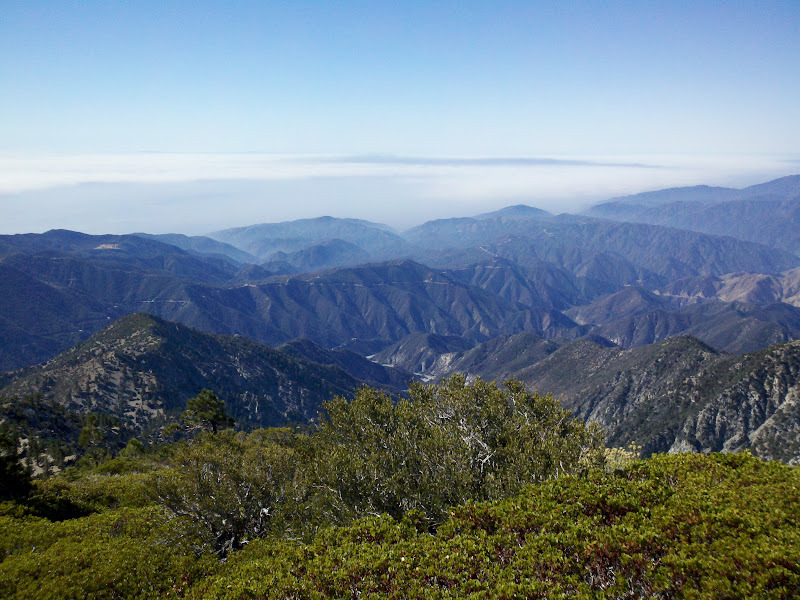 Register Ridge can be combined with Ski Hut Trail or Devil's Backbone Trail into a loop. 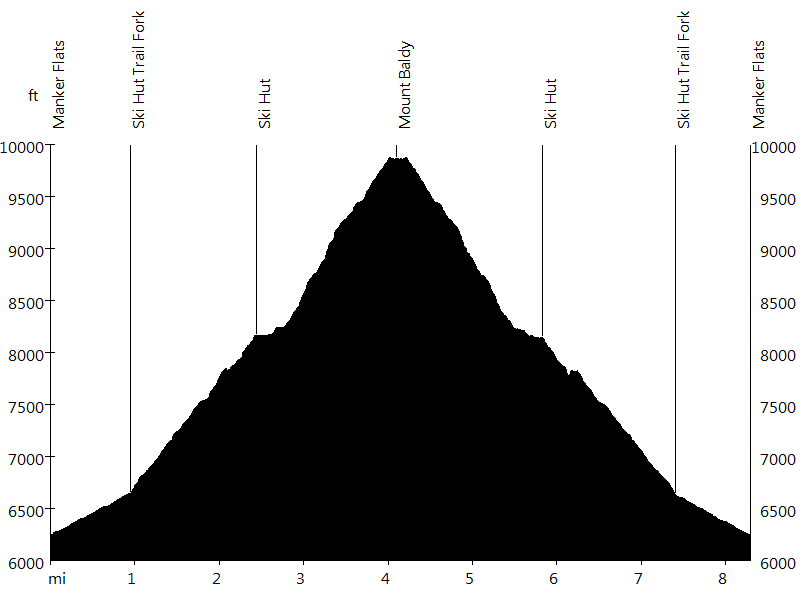 Bear Canyon Trail or Mount Baldy Trail is the ascent with the greatest elevation gain. The trailhead is on Bear Canyon Road at Mount Baldy Visitor Center. The first half mile is paved, then the trail begins. The initial one and a half miles to Bear Flats are covered by trees. Then the trail gets steeper and the terrain harder as it climbs the south ridge to the summit. Most of the ridge is exposed to sun and wind. Bear Canyon Trail was our first big day hike, an epic day in the mountains. Sandra and I started shortly after sunrise and finished shortly before sunset. In January, Sandra and I hiked Mount Baldy via Devil's Backbone Trail, and in May, Lisa and I hiked the same trail. In September, I hiked Mount Baldy via the Ski Hut Trail. I ran into my coworker Jay and his friend Allen. On the summit there were hundreds of runners from the Mt. 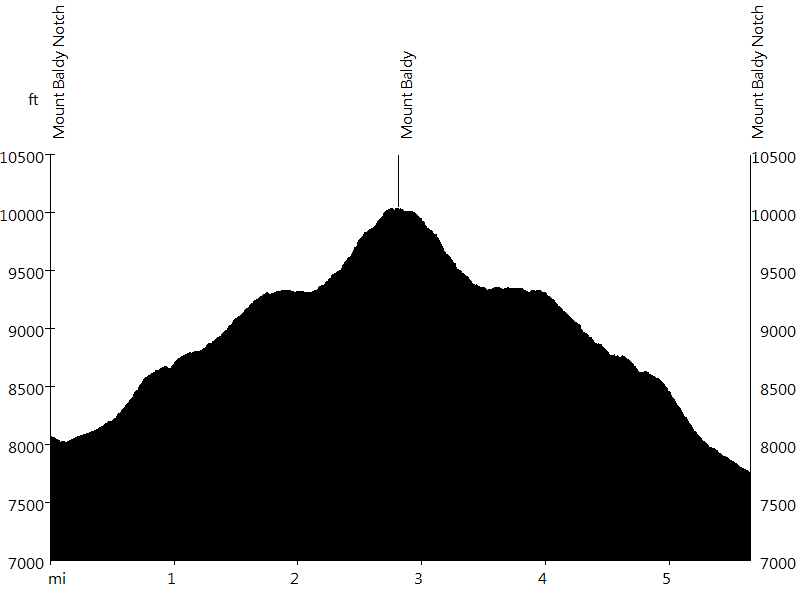 Baldy Run-to-the-Top event, which leads up Devil's Backbone Trail. In November, I hiked Mount Baldy and West Baldy via Devil's Backbone Trail, and in December, Sandra and I hiked Mount Baldy via the same trail in the snow. 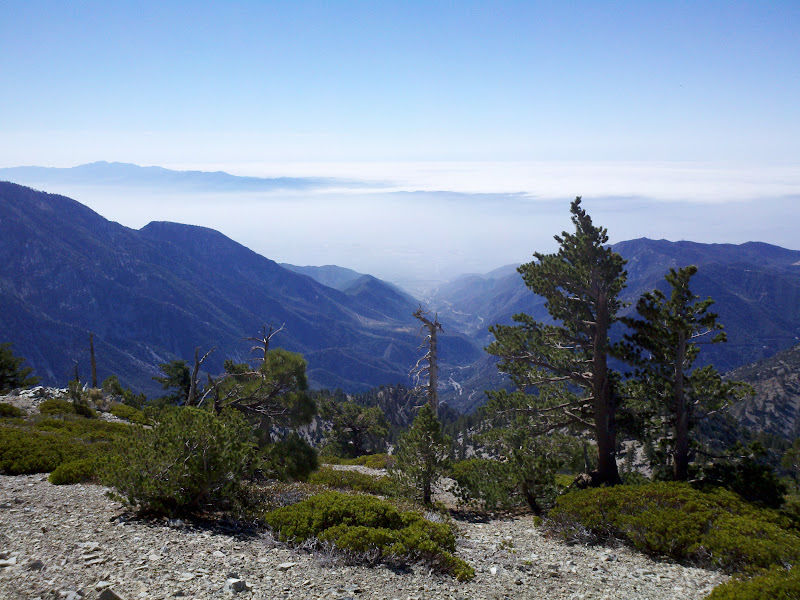 In August, I hiked Mount Baldy, ascending via the Ski Hut Trail and descending via Devil's Backbone Trail. 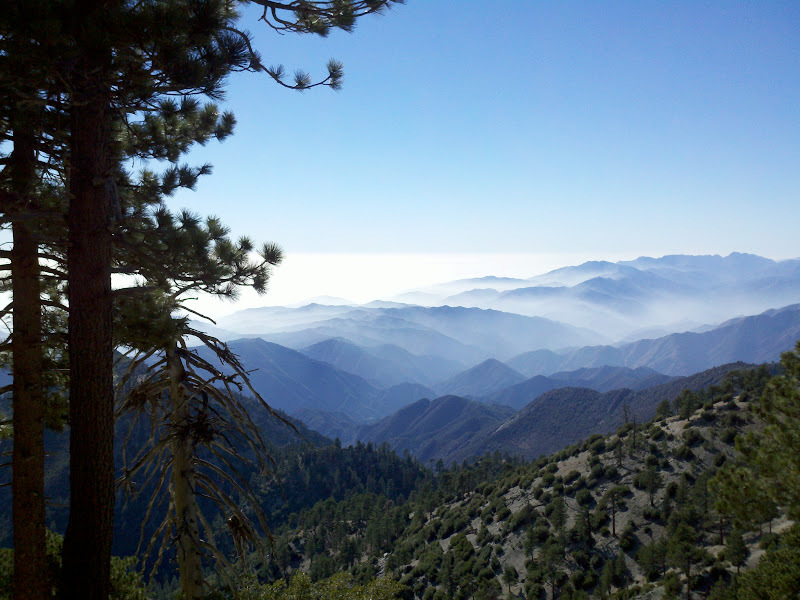 In November, I hiked Mount Harwood, Mount Baldy, and West Baldy via Register Ridge. The wind was very strong. In December, Sandra, Lisa, and I hiked Mount Baldy via Devil's Backbone Trail in the snow. The wind was again very strong. 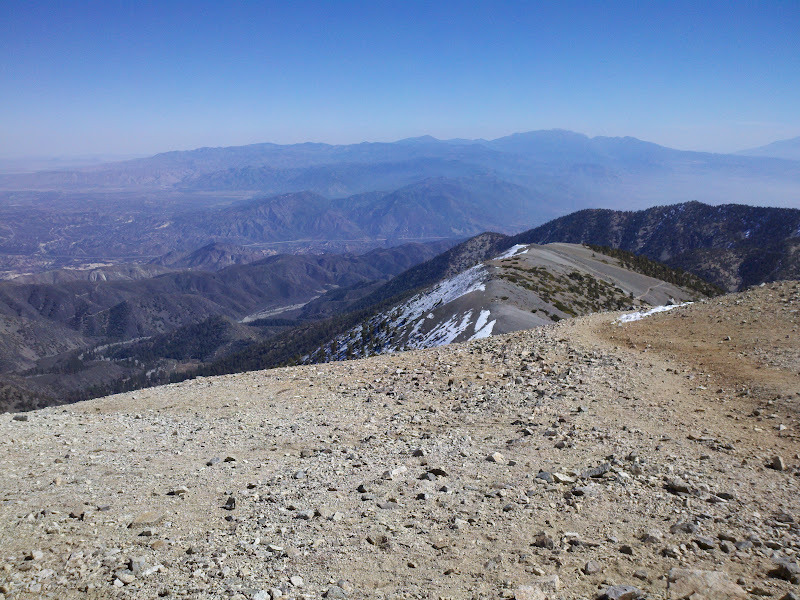 In March, I hiked Mount Baldy via the Ski Hut Trail in the snow. In May, Sandra, Biju C., and I hiked Mount Harwood and Mount Baldy, ascending via Register Ridge and descending via the Ski Hut Trail. 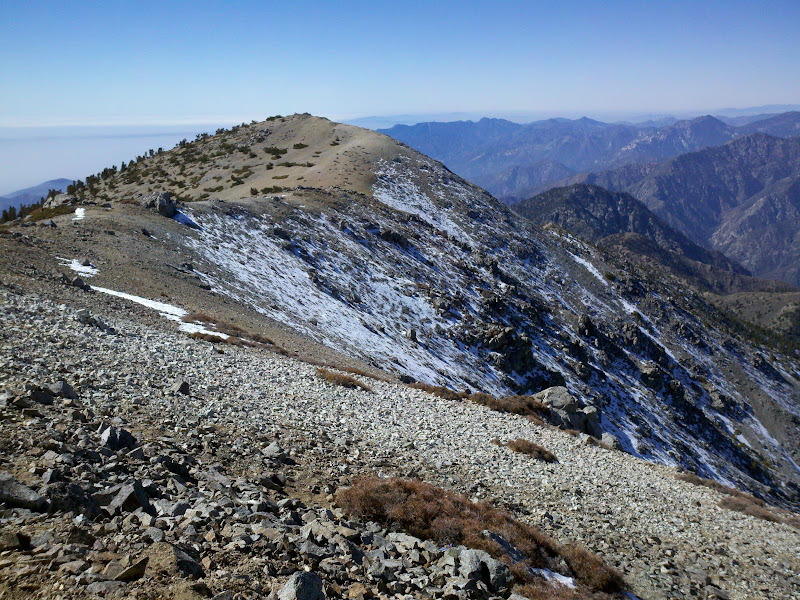 In December, I hiked Mount Baldy in the snow, ascending via Register Ridge and descending via the Ski Hut Trail. The wind was very strong. In May, Sandra and I hiked Mount Baldy via the Ski Hut Trail. I went off-trail to check out the wrecks of two Hellcat fighter aircraft, which crashed during a snowstorm in 1949. In May, I hiked Mount Baldy via the Ski Hut Trail.